Evaphone is completely online service so you do not need to download any program to make free international calls. I tested this service and it is working fine. You can make 2 free calls everyday. Free calls are ad supported, so a small ad will play before you can connect to a mobile number. It is completely online so it does need required any setup or any download and install. You can make free call almost in any cyber café. To make free calls you need a speaker or a headphone to listen voice and a USB phone or a microphone. 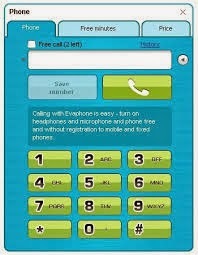 Visit http://www.evaphone.com to make FREE calls! VoipBuster offers an desktop application to make regular phones in various popular destinations worldwide for FREE. Free calls are limited to number of countries only. See the list of those countries here. When you download the application and signup for new free account, VoipBuster gives you free calls for a total of 60 minutes. During this trial period you can only call the destinations marked as free. After the trial period, you need to register your account by buying credit in order to extend your free calls. Your credit card will be charged just to register your account permanently. Your calls will still be free of cost in those selected countries. Registered users get max 300 minutes per week of free calls, measured over the last 7 days and per unique IP address. Daily Free calls limit: 60 minutes max. Free Internet Calls to more than 40 Destinations! No download and no registration required! Just enter your Phone Number, the number of the person you wish to call and Freebuzzer will connect both phones absolutely free! Freebuzzer is the smart way to make short and free calls all over the world. You don’t need to download anything, just use your browser to make Free Worldwide Internet Phone Calls! With Google Voice, you can make free phone calls, free PC to phone calls (via Google Talk browser plugin) right from your gmail inbox. With Google Voice, you can also get free SMS, make a free conference call, and get free voice mail services. Free phone calls with Google Voice are limited to three hours. However, you can continue to make free calls as long as you can. Free calls you make with Google Voice must be to numbers in the United States or Canada. Calls made to countries other than these two will be charged with a very low amount of money. iCall is another free option to make free calls. It offers you both web interface and a desktop application for Windows, Mac OS X, and Linux and iPhone. Free calls can be availed in only US and Canada. You will hear an advertisement before each for about 10 seconds. After that your call will be connected instantly which lasts long only for 5 minutes. Yes, you need to reconnect after every five minutes but you can call the number back again as many times as you want.